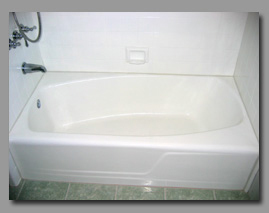 ﻿ Bathtub refinishing or resurfacing in Martin or Palm Beach County. B and F All Surface Refinishing services include tub and tile refinishing. We Refinish in Hours! From old to new within hours! Our refinishing system works beautifully on: Porcelain bathtubs, sinks, fiberglass shower enclosures, bathroom floors, pedestal sinks, ceramic tile, formica countertops, claw foot tubs, plastic tubs, kitchen cabinets, cultured marble counter tops, imitation marble, metal surfaces, plastic surfaces, vanities, shower-pans, bathroom floors, and various fiberglass and acrylic surfaces. The possibilities are endless. Our refinishing technique employs tecnology and Craftsmanship. The technology is in the coating and the application. Our coating bonds at the molecular level (covalent bond) it does not just sit on top. It is not a paint. Our technicians are craftsmen. Your kitchens and bathrooms are expertly prepared with great care. When we finish the job you wont believe your eyes. It looks brand new! 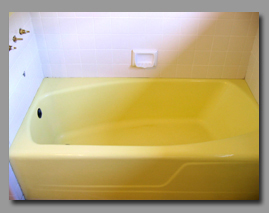 Bathtub Refinishing – Don’t Replace, Refinish! Bathtub refinishing is a cost effective bathroom makeover alternative to replacing a bathtub that is worn out, damaged, hard to clean, or simply a dated color. B and F All Surface Refinishing will repair chips or cracks and restore the surface to look and feel like new. You'll save thousands of dollars and avoid days or even weeks of demolition mess and costly replacement. Estimated Cost of Replacement of bathtub is estimated to be about $3500 by The National Kitchen and Bath Association. B and F All Surface Refinishing is premier at Kitchen and Bathroom tile refinishing or tile reglazing on your walls or countertops is a cost effective alternative to replacement. Tile replacement is expensive, and the process can be a mess. If your tile is chipped or cracked, or you are looking to update to a more modern look, tile refinishing may be for you! 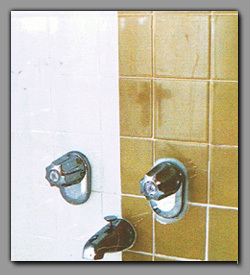 By refinishing tile you eliminate grout and caulk lines. Grout and caulk lines are susceptible to mold and mildew and can be difficult to clean. When you refinish tile you eliminate this issue and make cleaning a snap. Tile reglazing and bathtub reglazing together will eliminate the need for caulking between the tub and tile which will prevent mold and mildew problems and create one sealed watertight unit. B and F All Surface Refinishing also offers bathtub refinishing , countertop refinishing, kitchen cabinet refinishing, fiberglass refinishing, and some can offer bathtub anti-slip treatments. For bathtub refinishing Palm Beach County, bathtub refinishing West Palm Beach call 561-683-0553.